The world-renowned bestselling author has entertained millions of people with his storytelling. 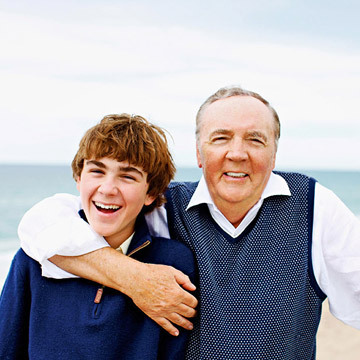 But at home in Palm Beach, Florida, he's just dad to son Jack, 13. Did you ever imagine your work would become so popular? It&apos;s an unbelievable treat to bring joy to so many lives and give people much-needed relaxation at the end of the day. Best of all, it&apos;s amazing to turn kids onto books. Speaking of which, you&apos;ve launched two amazing programs. ReadKiddoRead.com encourages reluctant readers to pick up a book for fun, while Book Dollars for Scholars awards incoming college freshmen with money to buy books. They&apos;ve both been so fulfilling. I&apos;ve had hundreds of people say to me—some with tears in their eyes—"Thank you for getting my kids to read." That kind of response means a lot more to me than any bestseller list. Although, I must admit, I still like being on those lists. While you're most known for writing thrillers and mysteries for adults, you've also published four very successful middle-grade and young-adult series. The first book in your latest middle-grade trilogy, Middle School: The Worst Years of My Life, just hit bookstores. I think my kids' books are better than my adult books in some ways. They're not only funny, but they also have important messages beneath the surface. For example, the Maximum Ride series (2007) is about kids getting together and taking responsibility for themselves and the people around them. The series Witch & Wizard (2009) emphasizes the gift of freedom in our society, something that many kids take for granted. Jack's now in seventh grade—did he inspire Middle School: The Worst Years of My Life? Well, I think most kids his age have that strange attitude about school. He and his friends are in a period where things are sometimes really, really good, but often quite bad. Everything is an extreme. The main character Rafe deals with a school bully. Has Jack? There were some mean kids a few years ago but he's past that now. I think kids have to stand up to others who try to push them around rather than run for help—unless they really need it. I remember being in third grade and a fifth grader was beating the heck out of me. At some point I just started throwing back punches. I didn't hurt him, but he was certainly surprised. He left me alone after that. Your wife Sue is also creative; she's an artist and photographer. Have the imaginative genes rubbed off on Jack? He definitely has a huge imagination. I'm not sure if it's from watching us around the house or if it's in his blood, but he's always coming up with ideas. In general he's a curious kid who loves to learn about the world. When he was younger he had a globe that audibly "spoke" facts about countries when pressed. Jack knew every location and every body of water and could tell you 10 to 15 things about most cities in the world! So where are you off to this summer? Jack hasn't planned it yet. But we're thinking of staying in the U.S. We've narrowed it down to San Francisco, Seattle or Alaska. How often are you and Sue able to get away for date nights? Every Friday night we go out to dinner and see a movie—nothing fancy, but it's still special. What do you and Jack do together for boys' time? Once a month we go to dinner, just the two of us. We also love golfing and seeing movies, mostly based on children's books or comic books. But I also like teaching him lessons through film. We saw Precious and Winter's Bone, which deal with serious issues. Before each showing we had a sit-down talk so Jack would know what to expect and I told him we could leave at any time if he wanted. But I think it's important to show him that there are people growing up in very different ways than him. Does Jack get a sneak peek of the books before they come out? Absolutely. It's like having my own private focus group. He tells me what he thinks kids will like. He plays it down, but he really likes my Daniel X and Witch & Wizard books. One of my favorite memories is taking Jack and my wife Sue to the Children's Book Awards in New York City last year. I was nominated, and Jack said to me, "Don't take this the wrong way, Dad. I love your books but [Rick] Riordan [author of the Percy Jackson series] is going to win." When I won, Jack leaped out of his seat. He was so surprised and excited. Onstage accepting the award, I told the crowd about our conversation. Then I held up the trophy and said, "This is for you, Jack." How you know him: James has sold more than 220 million copies of books from series such as his Alex Cross and Women's Murder Club novels to children's books like Daniel X, Maximum Ride and Witch & Wizard. He also holds a Guinness World Record for the most Hard Cover Fiction bestselling titles by a single author: 63. Ay caramba! "My proudest career accomplishment? Being on The Simpsons, of course!" In the episode, Marge is on the beach reading James' Kill the Girls when an animated-version of James rides up on a white horse and sweeps her off her feet, romance novel-style! Bedtime stories: "I have two books on my nightstand: How to Live: Or A Life of Montaigne in One Question and Twenty Attempts at an Answer by Sarah Bakewell, and The Passage by Justin Cronin. House rules: "Obey your mother and father at all times, no matter what we say and no matter how insane we seem! Seriously, we don't have too many rules for Jack. He has to read on the weekends and every day in the summer. Bed time is 10 p.m., TV and computer time is restricted to an hour a day, and he has to make his bed in the mornings." Girl talk: "I've tried to talk to Jack about girls, but nothing too heavy. I've told him not to take advantage of anyone and not to let anyone take advantage of him. But he always stops me and says, 'Dad, I'm 13!'" Motto: "Knowledge is valuable, but imagination is invaluable." Originally published in the July 2011 issue of Family Circle magazine.